With the series pocketed after a record-breaking win in Trent Bridge England will now aim for a whitewash when they take on Australia in the fourth of five ODIs on Thursday, June 21. Join The Roar for live scores and coverage of the fourth ODI from 11pm (AEST). The record books were re-written at Trent Bridge on Tuesday as England smashed their own record for the highest score in an ODI, scoring a massive six for 481 in turn thrashing Australia by an emphatic 242 runs. It was an incredible performance and one that gave the home side a five-match0 lead in their five match series. The result gave England their biggest ever victory in ODI cricket, whilst, for Australia, it was their heaviest ever defeat. 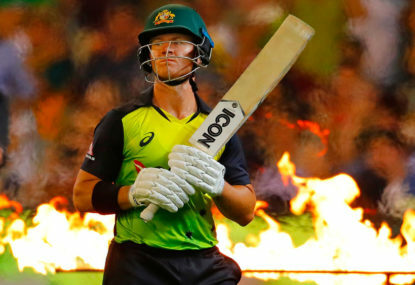 Going into the match, both teams made one change from the last match in Glamorgan – Billy Stanlake replaced Kane Richardson for Australia, whilst England welcomed back captain Eoin Morgan in place of Sam Billings. As in Wales, Australia won the toss and decided to field first. It turned out to be a decision they would regret on a good pitch on a ground with short boundaries. The England batsmen tore into the Australian bowlers from the start, none of whom, with the possible exception of Jhye Richardson who finished with three wickets, will be in a hurry to review their figures again. The run blitz started with the opening pair of Jason Roy and Jonny Bairstow, who smashed 159 in an opening stand in just 19 overs, before Roy, who had hit 4 sixes, was run out by D’Arcy Short. Bairstow then reached his fourth century in six ODIs, by thrashing Short over mid-wicket for a maximum, and the onslaught continued with Alex Hayles now at the crease. Bairstow was eventually caught at deep square leg off the bowling of Ashton Agar for 139 and Australia hoped they had stemmed the run fest. Not a bit of it. Morgan joined Hales in the middle, and the pace of scoring, if anything, picked up. Hales, playing in front of his home crowd, reached his sixth ODI century, and the pair put on 124 in just 10 overs, as Australia were put to the sword. Hales eventually fell for 147, having hit 5 sixes, and Morgan went one ball later for 67, having surpassed Ian Bell to become the highest ODI scorer in England’s history. His innings contained, 6 sixes, one of 21 scored in the England innings, which was the second highest score ever in a first class 50 overs a side match. Faced with such an imposing total, Australia were up against it from the start and they were rarely in the hunt to even get close to the score. Going into this match, Australia might want to make a few changes again in order to get their best team while England, if they do bring in someone, would be doing that to give as many players a chance in this series. More of the same with England expected to romp home to a 4-0 scoreline at the end of the game. Australia to show a lot more fight though if they bat first. Be sure to join The Roar for live coverage of this 4th ODI at Chester-le-Street from 11pm (AEST) and don’t forget to drop a comment in the section below.